Our observation team during that night was myself, J. Nomen and M. Hurtado. We also had support from a number of colleagues at DEIMOS (from the company’s Space Situational Awareness division), especially for development of some of the software tools we use at the observatory. 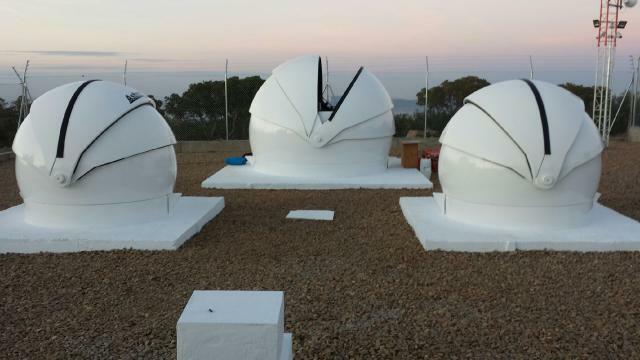 The image was taken at the Deimos Sky Survey, a new observatory set up by ELECNOR DEIMOS. Conditions were a bit tough as the spacecraft came up only 15 degrees above horizon, so it was a challenge! The observatory is located on Niefla Mountain (N38.54362 W4.40844), not too far from Ciudad Real, south and west of Madrid, and it hosts three optical sensors. These are being developed for future surveys of space debris and asteroids (the site is now in the commissioning phase). At the time of the imaging, LISA Pathfinder was about 11 000 km above the centre of Earth. Thank you, Noelia and team, for a fabulous image!